It came as something of a surprise to me that I chose to paint bicycles this month. I am not a cyclist myself - not by any stretch of the imagination. Even so the idea of doing a whole bicycle series has bubbling around in the back of my mind for ages. 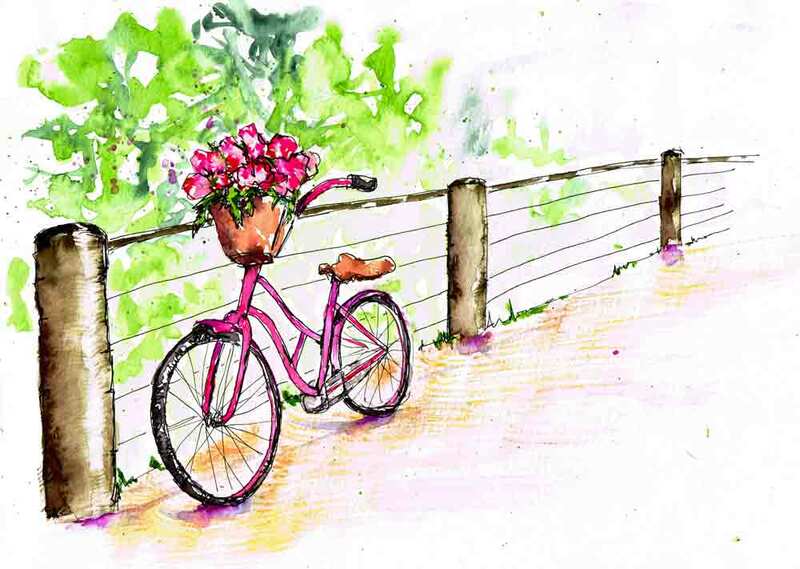 I thought it was because the bicycle presents a good challenge from a sketching point of view. All those spokes and angles and lovely round wheels. But of course there is always more to it. As I drew and painted bikes I kept finding myself describing it as a ‘romantic notion’. And it is. The bicycle represents freedom. An independent way to propel yourself to a location of your choosing and not miss a thing along the way. Fresh air and bright skies. Grassy fields or beachside tracks. The world can be your oyster. To be totally honest, the idea of this alone is enough for me. I am happy to pedal through the world vicariously, by paintbrush. Freedom and escape are a state of mind. If you can’t or won't venture out you can still take a little mental vacation. On the subject of romantic notions, I can't go passed the blossoms that are just as important to me this month as the bicycles. Flowers have always been one of my favourite painting subjects. Actually, they are just one of my favourite things. To me they are a symbol of joy. A radiant, fragrant expression of delight. Their energy and colour testify to the simple beauty of everyday things. “Gather ye rosebuds, while ye may”. I love the idea of riding around with a bunch of blossoms embellishing the bottom of my view, framing whatever appears before me. The basket on the front of the bicycle feels like a childhood delight. I picture streamers on the handlebars and the basket filled with childhood treasures. Teddy bears, bits of string and interesting seedpods, perhaps? While my adult mind has retained the basket I choose to mentally fill it with blooms. An abundance of blossoms that remind me to gather the small joys in each moment before they fly by. May you pedal through life with your heart a full basket of joy.